Nicknamed "Tante Ju" (Auntie Ju) and "Iron Annie" by Axis and Allied troops, the Junkers Ju-52 was the most famous German transport of the war. The Ju-52 was built of corrugated metal skin and paid little attention to beauty, features of a typical Junkers design. Parts and pieces stuck out of the airframe, and the corrugated skin, though much stronger than fabric and metal tubes, created stronger air resistance. In April 1931, the originally single-engined Ju-52 prototype was fitted with three engines. Performance improved tremendously and production of the new model immediately began. The Ju-52 served as an airliner for many nations. Finland, Spain, Sweden and Germany were just a few. It served as a mail carrier in China, and, fitted with floats, hauled lumber in remote places in Canada. Its most commom work, however, was done with the German Lufthansa. Equipped with luxaries like a typewriter and oxygen masks, the Ju-52 could fly from Berlin to Rome in eight hours over the Alps, an impressive feat for contemporary aircraft, let alone an airliner. 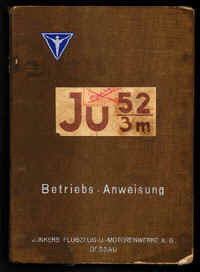 The military potentials of the Ju-52 was not overlooked by the Luftwaffe. It entered service as a troop transport and bomber. In the Spanish Civil War, the Ju-52 ferried some 10'000 Moorish troops from Morocco to Spain, and bombed Madrid while, quite embarrassingly, some Lufthansa Ju-52s were in the airport serving as airliners. Later in World War II, the Ju-52 served in every theater in which Germany participated. 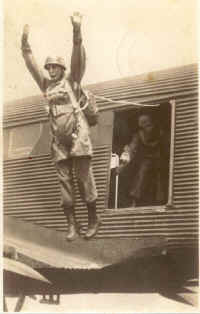 It dropped paratroopers in the Netherlands, Crete and later the Ardennes. It carried supplies to beleagued troops in North Africa, Stalingrad and the Baltic states. The Ju-52 was slow and very lightly armed against fighters. As a result, it suffered horrible losses in almost all actions, especially over Crete, the Mediterranean and Stalingrad. Many types of replacement were built, but none was as popular or reliable as good old Auntie Ju. Right until the end of the war the Ju-52 was still soldiering on to help stave off defeat. 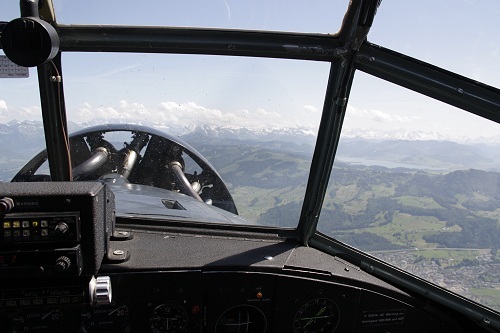 The last Ju-52s went out of service with the Swiss Air Force in the late 1980s ­ over 50 years after the first of these durable aircraft first took to the air. Some Ju-52s are still flying today. The initial Ju 52 was a signle-engine aircraft. Since it lacked performance, and the state of technology couldn't deliver higher performance engines yet, Junkers decided to add 2 additional engines, both mounted on the wing. The designation then received the '/3m'. · Ju 52/3m ce: Version for A.B. Aerotransport of Sweden, Aero O/Y of Finland, and Deutsche Lufthansa. It had cowled engines and spatted mainwheels. This version was mostly used by the Condor Legion in Spain. It had a number of internal improvements, and a tailwheel in stead of a tail skid. This version was not u\only produced by Junkers, and the number exceeded 500 aircraft. In 1937 it was slowly withdrawn from it's bomber role, and served more as a transport, bomber-crew trainer, or in the airborne forces role. 12 Aircraft have been converted to Convoy Escorts. These aircraft, like the YB-40 with the B-17, defended it's brothers during sorties. For that reason the 'Geleitschutzflugzeuge' were fitted with the ventral 'Dustbin' again, 2 more 0.312 inch (7,92 mm) guns in the beam positions, and a 20 mm trainable cannon in the nose. This version was converted for Mine-sweeping duties. For that reason it was fitted with a large Dural hoop braced beneath the wing and fuselage. This hoop was than energised by an additional motor that was installed in the fuselage. The magnetic field that was generated that way, triggered magnetically fused mines. This version was an improvement upon the Junkers Ju 52/3m g4e. It had more comprehensive radio equipment, a de-icing system that used the exhaust, provision for an interchangeable wheel ski or float landing gear, provision for 2 × 0.312 inch (7,92 mm) trainable lateral-firing guns in the beam positions, and an uprated powerplant: 3 × BMW 132T-2 radials, rated at 830 hp (619 kW). The land planes had a max take-off weight of 23,148 lb (10.500 kg). This version was converted for Mine-sweeping duties. This version is almost identical to the Junkers Ju 52/3m g5e, and was produced in parallel with it as well. The difference was the fact that it was a purely land based aircraft, and had simpler radio equipment. Junkers Ju 52/3m g6e (MS) This version was converted for Mine-sweeping duties. From 1941 onward, the Junkers Ju 52/3m g7e was built. It was based on the Junkers Ju 52/3m g5e, but had a number of improvements: an autopilot, a larger starboard-side loading hatch, and a rearward extension of the upper part of the central engine. On some aircraft there was an open position created in the cockpit's overhead glazing, to accomodate 1 × 0.312 inch (7,92 mm) MG 15 trainable rearward-firing gun. Junkers Ju 52/3m g7e (MS) This version was converted for Mine-sweeping duties. Junkers Ju 52/3m g8e (MS) This version was converted for Mine-sweeping duties. .
Based on the Junkers Ju 52/3m g9e, but fitted with alternatively skis or floats. The final production version. This version featured armor protection for the pilot, and had a standard defensive armament of 1 × 0.51 inch (13 mm) MG 131 in the rear dorsal position, and 3 × 0.312 inch (7,92 mm) MG 15 each in one of the beam positions, and 1 in a low-drag copula over the cockpit. Postwar version of the Ju 52/3m, built by a French company. CASA 352 Postwar version of the Ju 52/3m, built by a Spanish company.